The changes to the schedule were initially caused by issues with STS-134’s payload – the Alpha Magnetic Spectrometer (AMS) – which required both the slipping of the launch date and the eventual decision to change the mission order. With Discovery’s STS-133 mission moving ahead of Endeavour, additional challenges with the conversion of the Multi-Purpose Logistics Module (MPLM) Leonardo into the Permanent Multi-Purpose Module (PMM), and a decision to add two EVAs and three docked days to the mission also played a factor in the schedule debate, moving STS-133 to “No Earlier Than (NET)” the end of October. The launch date decision was taken at Thursday’s Program Requirements Control Board (PRCB) meeting, which refined internal launch targets by a couple of days. As always, all targets remain subject to change, with the actual approval of a mission’s launch date taking place at the Level I Agency Flight Readiness Review (FRR), around two weeks prior to launch. “At the PRCB today (Thursday), the Space Shuttle Program (SSP) approved the STS-133 launch date as November 1, 2010 and the STS-134 launch date as February 26, 2011,” noted the official notice to the SSP team members (L2). November 1 currently allows for a week-long launch window, prior to a long standdown via a beta-angle cut-out which lasts until November 23, followed by Dual Docked Operations (DDO) constraints, caused by the arrival of several vehicles over the interim period – starting with the late November/early December launch of the second ESA Automated Transfer Vehicle (ATV-2). As far as STS-134’s launch date is concerned, the February 26 target – which is two days earlier than internal processing notes had listed just recently – may actually move to the left by a week or so, based on the outcome of political discussions on whether to fund SSP further into 2011, mainly to allow for the launch of the notional STS-135 mission. “For STS-134, (SSP manager) John Shannon said that it is not necessary for us to protect for a launch date in early February 2011,” added the memo. “He stated that if by Aug/Sept 2010 it looks like STS-135 is not going to happen next summer and if it looks like SSP funding may be running out by the end of Feb 2011, then we may need to consider backing up the STS-134 launch date a week or so, but not as far back as early February. Currently processing as STS-335 – the Launch On Need (LON) rescue support for STS-134 – the opportunity to convert what is currently Atlantis’ flight into a full mission remains at the mercy of lawmakers. Should STS-135 become a reality, internal milestones have already noted a desire to target a launch on July 24, 2011. Such a date would align with Thursday’s launch date decisions for STS-133 and STS-134, whilst bridging part of the gap between the end of shuttle and the operational use of the commercial vehicles – which will attempt to pick up on at least some of the resupply demands of the International Space Station (ISS). 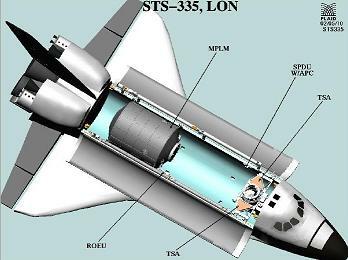 A transition of STS-335 into STS-135 wouldn’t be problematic from a hardware standpoint, with the Solid Rocket Booster set – SRB BI-146 / RSRM 114 – already being processed at KSC’s Rotation Processing and Surge Facility (RPSF), and the refurbishment of External Tank (ET-122) proceeding to plan. However, a decision – and the allocation of funding – is required soon, in order to allow managers to build a mission profile via the baselining process, along with the planning and implementation of crew training (crew loading). Sources note that a political will exists to fly STS-135, with some activity also noted on looking into the potential for an additional mission in 2012. STS-136, which would likely be awarded to Endeavour, utilizing a spare tank located at MAF called ET-94, per L2 notes – and recently reported by this site. 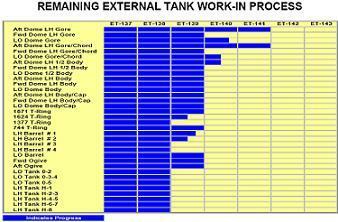 A loss of upmass would be charged against the mission, given ET-94 is only a Light Weight Tank (LWT), as opposed to the Super Light Weight Tanks (SLWT) that have been used in recent years. An alternative option of using one of the three part built tanks at MAF holds some potential to support a 2012 mission, providing a long-lead item of certifying the latest version the Thermal Protection System (TPS) foam (BX-265) is removed or advanced – currently noted as a constraint to new tank production/completion prior to 2012. As seen via the 700+ page final assessment into the Shuttle Derived Heavy Launch Vehicle (SD HLV), three part built tanks exist in New Orleans, with ET-139 in a surprisingly advanced stage of fabrication. While work has ceased on all three tanks, they remain in secure storage, as does all of the required machinery to complete the tanks. However, the required skill sets of the remaining workforce are being depleted as 2010 progresses, which adds to the requirement of a decision taking place – even on the notional STS-136 flight in two years time – “within months”, in order to keep costs down and additional funding levels viable. In both the STS-135 and STS-136 scenarios, LON would be provided by two Russian Soyuz vehicles, meaning both missions would not launch with a crew greater than four. 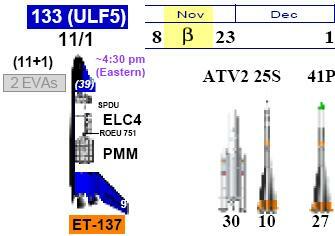 Adding STS-136 would likely result in STS-134 and STS-135 slipping to the right to align with the 2012 mission. With the shuttle shutdown continuing at a pace, and seemingly unchecked – even from a contingency standpoint – by NASA’s current administration, each month that passes achieves their stated goal of ending the shuttle era at the earliest possible convenience, thus removing the viability of any political moves to ‘refine’ President Obama’s highly unpopular FY2011 proposal to the point that it includes a mini shuttle extension. Such political moves continue to be based around adding STS-135, as noted by Senator Kay Bailey Hutchison – who issues a release after the confirmation the shuttle manifest had slipped into 2011. Congresswoman Suzanne Kosmas went a step further, requesting additional missions past STS-135, in order to support the extension of the ISS through 2020. However, should political discussion fail to turn into political decisions by the fall of this year, it is likely Endeavour’s STS-134 mission will be the final flight of the space shuttle.